Emission controls the color and intensity of light emitted from the surface. 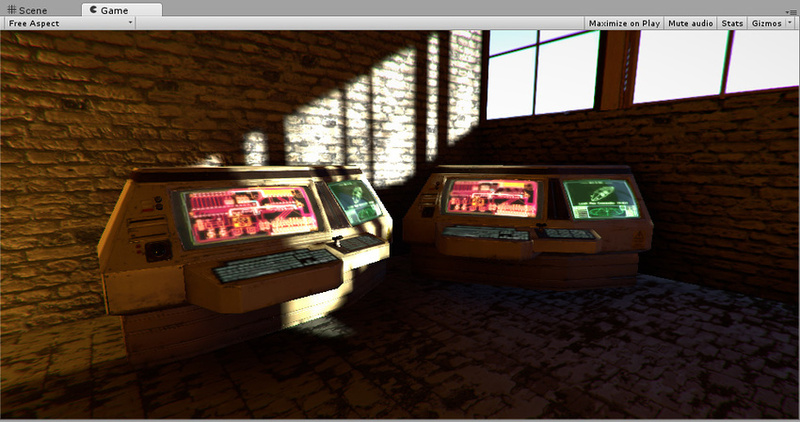 When you use an emissive Material in your Scene, it appears as a visible source of light. The GameObject appears to be self-illuminated. Emissive materials are usually used on GameObjects where some part should appear to be lit up from inside, such as the screen of a monitor, the disc brakes of a car braking at high speed, glowing buttons on a control panel, or a monster’s eyes which are visible in the dark. 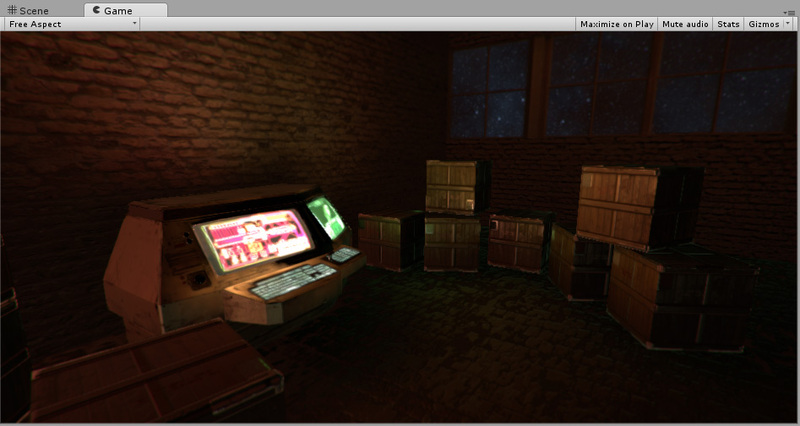 GameObjects that use these materials appear to remain bright even in dark areas of your Scene. Red, Green and Blue spheres using emissive materials. Even though they are in a dark Scene, they appear to be lit from an internal light source. 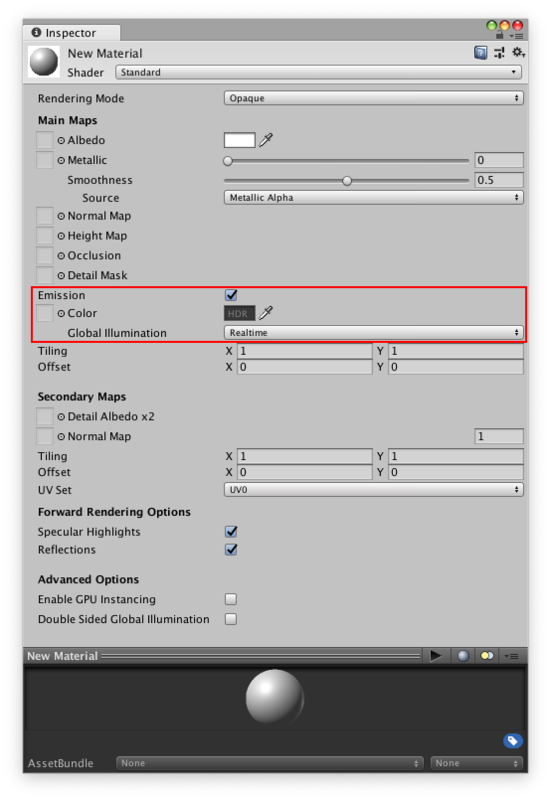 As well as simple control over emission using a flat color and brightness setting, you can assign an emission map to this parameter. As with the other texture map parameters, this gives you much finer control over which areas of your material appear to emit light. 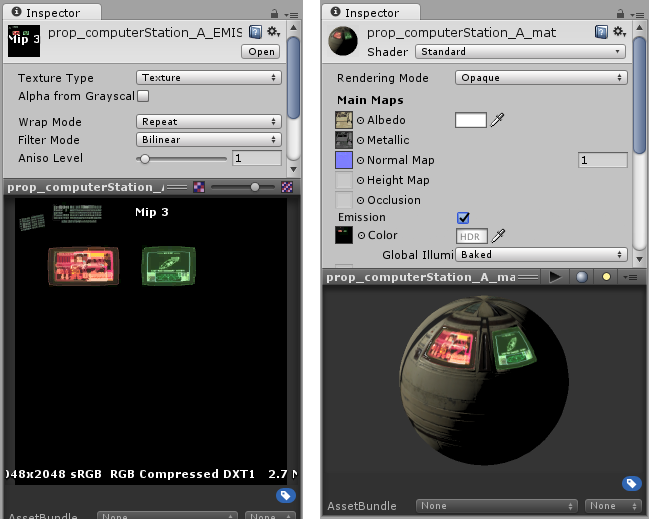 If a texture map is assigned, the full color values of the texture are used for the emission color and brightness. You can use the emission value intensity field to boost or reduce the overall emission level of your material. Se muestra en el inspector, Izquierda: Un mapa de emisiones para un terminal de computadora. Tiene dos pantallas brillantes y teclas brillantes en un teclado. Derecha: El material emisivo usando el mapa de emisiones. El material tiene áreas emisivas y no emisivas. En esta imagen, hay áreas de niveles altos y bajos de luz y sombras que caen a través de las áreas emisivas, lo que da una representación completa de cómo los materiales emisivos se ven bajo condiciones de luz variables. Realtime - Unity adds the emissive light from this Material to the Realtime Global Illumination calculations for the Scene. This means that this emissive light affects the illumination of nearby GameObjects, including ones that are moving. Baked - The emissive light from this material is baked into the static lightmaps for the Scene, so other nearby static GameObjects appear to be lit by this material, but dynamic GameObjects are affected.